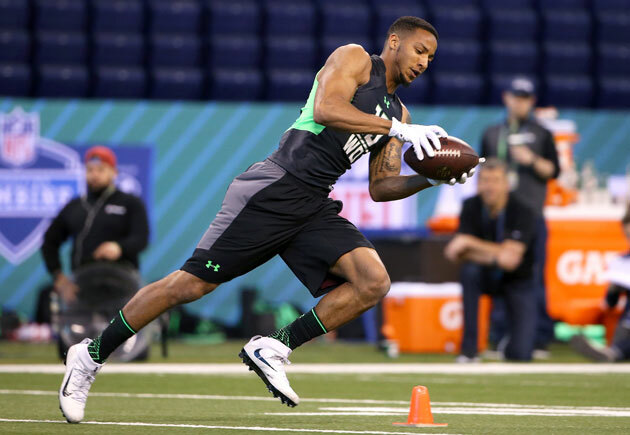 Josh Doctson's journey from undersized walk-on to top WR prospect in the 2016 NFL draft. Get all of Joan Niesen’s columns as soon as they’re published. Download the new Sports Illustrated app (iOS or Android) and personalize your experience by following your favorite teams and SI writers. Tracy Syler-Jones had made up her mind. As she pulled her son out to the back patio of their Mansfield, Texas, home to talk, she told herself that she wouldn't step down. The skinny 16-year-old's arm was in a sling, and Syler-Jones couldn't stop thinking about their ride to the hospital after he had been injured at his football scrimmage. With every bump the car hit, he had screamed in pain. A broken collarbone was the diagnosis, and it was too much. "You're not playing football anymore," Syler-Jones told her son. "You're done. I'm done. We're done." But he wouldn't have it. Josh Doctson is stubborn, and standing there that day in the late-summer Texas swelter, he argued right back. He told his mother how much he loved the game, how he would heal, how he couldn't quit. For a time, neither budged. Eventually, though, Syler-Jones relented. She saw how much football meant to her son, and she didn't want him to look back years later and wonder what might have been had his mother not forced his hand. What might have been? Neither dreamed of this, of the TCU records that would fall, of the NFL scouts' jaws that would drop, of the first-round projections heading into the 2016 draft. As a high school junior, collarbone snapped, Doctson wasn't being recruited to play in college. But something in her son's tone that day told Syler-Jones to let him be, and so she drove him, splint and all, to Mansfield Legacy High's team picture. Coach Chris Melson was shocked. He'd seen the injury and was sure it was the end for his undersized receiver. He would have understood. Maybe the kid was too skinny. Maybe he was too fragile. Years later, he'd be too homesick, too slow and still too skinny. Football never seemed to want Doctson, and time after time, he wondered if he didn't want it. But he never walked away. That Doctson even took up the sport now set to pay him millions happened by chance. As a kid he had always loved basketball, but when he moved to Mansfield in middle school, he fell in with a crowd of boys who played football. In seventh grade he signed up, and years of hooping lent him an element of body control and hand-eye coordination that made him an instant fit at receiver. Still, Syler-Jones worried about the time commitment necessary to play two sports. By then she was working in the marketing department at TCU, and she asked Horned Frogs athletic director Danny Morrison (now the president of the Panthers) what he thought. Morrison disagreed. Let him do both, the AD said. The skills might transfer. In high school Doctson grew to 6' 2" and became an undersized center on Legacy's basketball team, and on the gridiron he impressed thanks to his knack for snaring nearly uncatchable passes. But he wasn't recruited for either sport. He was a point guard playing the post, a string bean in pads. Then, in the fall of 2010, collarbone healed, Doctson had a breakout senior season. He finished with 40 receptions for 640 yards and a nod as Legacy's MVP, but with recruiters visiting in droves to see future Arkansas cornerback Tevin Mitchel, Doctson drew scant interest. "I just don't think they thought he was fast enough, and he wasn't very big," Melson says. "But if you put on the tape and watched him catch the ball, it was kind of freakish." Over the season, a few recruiting leads emerged, but each came to nothing—until a visit by Derek Sage, then Wyoming's receivers coach. The foray into Texas was Sage's first as an FBS recruiter, and he assumed the pickings would be slim for a middling program from the Mountain West. As he began his circuit of Dallas-area schools, the coach reminded himself: Look for the overlooked kid, the one deemed too small or too slow by the likes of Texas, Texas A&M, Baylor and the rest of the Power 5. Sage, who now coaches receivers at Toledo, reported to Legacy's practice at 3 p.m., and Doctson caught his eye. After asking around, Sage learned that he had yet to secure a concrete offer from an FBS school. The coach was shocked. Sure, Doctson might not have had the stature to garner interest from the cream of the college football crop, but he seemed talented enough for a smaller program. "It doesn't happen that often," Sage muses, "but I knew I wanted this kid." 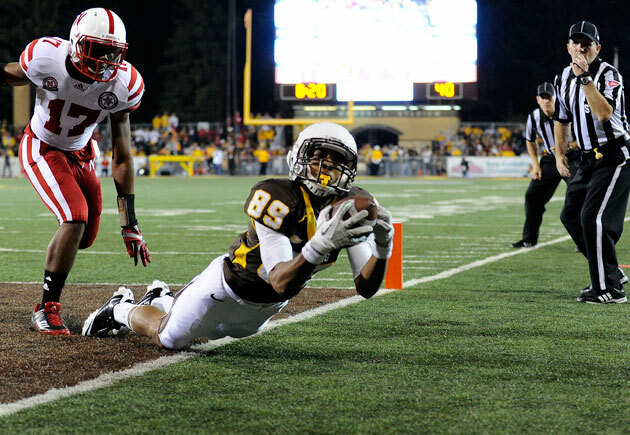 Certain he wasn't the only recruiter who would take notice, Sage placed a call to campus in Laramie. He realized he had no idea how to extend a scholarship offer, what minutiae might be involved, or if he needed head coach Dave Christensen's approval. He didn't, it turned out—at least not for receivers. You want him, you offer him. And so as practice ended, Sage pulled Doctson aside. "You've got a scholarship from Wyoming," he told him. There was one catch: Doctson always dreamed of attending school in California, and as November turned to December he had not solidified his plans. He fixated on the West Coast, but Syler-Jones tried to open his eyes. "I was not thinking this would be anything more than he'd play a sport, and he's going to get a degree, and he's going to take that degree and move to California," she says. Still, Doctson resisted taking his official visit. Melson was baffled. Accept the free trip, he said, and see a part of the country you likely won't otherwise. Doctson gave in, and after his weekend at Wyoming he committed. Football wasn't done with him yet. Doctson saw significant playing time as a freshman, with his first touchdown coming against none other than TCU in a 31–20 loss on Nov. 5, 2011. He logged 35 receptions for 393 yards with five touchdowns on the year, and the Cowboys earned their second postseason berth in three seasons, an eventual 37–15 defeat to Temple in the New Mexico Bowl. Yet despite finding moderate success on the field, he was unhappy. His paternal grandfather, James Doctson, was terminally ill with cancer and living in Alabama, and Wyoming seemed a planet away. Visiting was close to impossible, and Doctson felt cut off from the people he loved. As the semester progressed, he vented to friends and family. He wanted to go home. Coaches sensed something was amiss. They had seen it before; with the Wyoming campus tucked away in a remote location, Sage says he felt like he had to re-recruit several of the Cowboys' players every season during his time in Laramie. So, it came as more of a disappointment than a surprise when Doctson informed the staff after the loss to Temple that he wouldn't return. The decision came after another protracted argument with Syler-Jones. She didn't like that her son wasn't seeing his freshman year through, and she suspected his situation might improve if he allowed himself more time. But Doctson was resolute. He was leaving, even if that meant sidetracking his football career. Knowing full well he might not get the opportunity to play meaningful downs at an FBS program again, he packed his belongings and headed to Texas, where he rushed to enroll at Tarrant County Community College. He would take classes there for a semester, he told himself, while looking for a spot on a nearby school's roster. Friends figured he was angling for TCU, where Syler-Jones still works, but Doctson told them that was out of the question. "TCU, they didn't want me," he recalls, and so he figured his best option would be Texas State or the University of North Texas. And maybe the Horned Frogs didn't want Doctson—or maybe he just hadn't asked. Unbeknownst to him, Melson had called Rusty Burns, TCU's receivers coach, in early January 2012. He had told his acquaintance about his former wideout, that he was home and without a team. Meanwhile, Doctson and Syler-Jones were spending Saturday of Martin Luther King weekend in long lines at TCC, signing up for classes (Tuesdays and Thursdays only, so Doctson could also get a part-time job) and renting books. On Sunday, 48 hours before Doctson was set to begin classes, the receiver ignored a call from Melson while he was driving. He figured his coach wanted to talk X's and O's, and he didn't feel like chatting. But Melson left a message. Doctson listened. TCU might be interested … Rusty Burns may be giving you a call … Call me back. When Doctson got in touch with Melson, his first words were a weak rebuttal: "I'm already going to school, community college." The receiver could not imagine a world where the team he had cheered nearly his entire life, which was about to enter the Big 12 after the most successful four-year run in program history, would want him. But after talking to Burns, he began to believe. He could walk on, and thanks to tuition reimbursement for employees' children, Syler-Jones would only be on the hook for room and board. When he called his mother to tell her the news, she was walking into a doctor's appointment and could barely fathom what she'd heard. Scrap community college, scrap a fast-food job on the side, scrap the books they had rented and transcripts they had procured—they would do it in a heartbeat. This could be when the story turns fairy tale, when the unwanted recruit makes good on the team he was never good enough to make. It isn't. Football wasn't finished toying with Doctson, and when he arrived at TCU in January 2012, he felt alone. With no roommate and no real friends, he spent most weekends early in his first semester at home, about 20 miles away, with his mother and stepfather. When he had a question about campus, he turned to Syler-Jones, who felt she needed to dole out tough love. Where's this building? Check a map! "If you're coming back here, you're going to have to figure out how to do it all," she recalls telling him. "That was my challenge to him. I'm not going to help you figure it out." Her tactics worked. Soon after spring practices began, Doctson fell in with a group of scout-team players, and his visits to Mansfield lessened. He was thrilled to be back on the field, but his joy was temporary. It didn't take long for Doctson to wonder, again, if he had made the right choice. "Everyone was much faster than me, and stronger," he says of those early days. "It was really difficult to translate my game into a serious Division I college like TCU." Doctson was small—he weighed just 175 pounds during that debut season in Fort Worth—and though his ball skills stood out among the receiver group, what had been enough in the Mountain West didn't suffice in the Big 12. He felt slow in drills, and his routes needed to be crisper. Although it had been years since he had given up hoops in favor of the gridiron, it dawned on him that spring: He still felt like a basketball player attempting to master a second sport. To catch up, Doctson hit the weight room in earnest. It was no quick fix, and as his scout-team year wore on he questioned his decision. He was at TCU, where tuition would be covered with or without football. This isn't for everybody, he would think after his worst practices. After his best, he'd remind himself: Four more years. You can do four more years. You love this. So he stayed. But Doctson wasn't content to lift weights and hope that would eventually even the playing field. Instead, he figured the best way to improve would be to get inside the heads of the players charged with stopping him. Doctson turned to TCU's defensive backs—in particular Jason Verrett, whom the Chargers picked in the first round of the 2014 NFL draft, and Kevin White, who signed with the Falcons as an undrafted free agent last spring—to pick their brains. Verrett says Doctson wanted to know every element of what makes a receiver elusive in the eyes of a cornerback. Speed, vision, cuts and separation—he resolved to work on all of them. He also overhauled his nutrition, cutting out the soda and fast food that had always been staples of his diet. By the end of his first year at TCU, Doctson felt more comfortable. He'd become a leader on the scout team, a receiver who could go toe to toe with starting corners. Still, after missing a season in accordance with NCAA transfer rules, he wondered if he'd ever be an impact player for the Horned Frogs. After the 2012 campaign, at TCU's annual football banquet, he won an award: offensive MVP of the scout team. When he returned to his seat with the plaque, he turned to his mother. "Here you go," he told her. "It's probably the only award I'm ever going to get." During his redshirt sophomore season at TCU in 2013, Doctson played in 10 games, totaling 36 catches for 440 yards with four touchdowns. The next year he became a starter, racking up 1,018 yards with 11 scores. He was the school's leading receiver in '14 by nearly 300 yards, and behind him and quarterback Trevone Boykin the Horned Frogs finished 12–1 with the No. 7 passing offense (347.5 yards per game) and No. 2 scoring offense (46.5 points per game) in college football. Scouts began to take notice, and even the most cautiously optimistic friends and family members began to entertain the idea that Doctson might be able to play in the NFL. It wasn't until last fall, though, that most realized the scope of what Doctson had become. As the 2015 season unfolded, he emerged as one of the faces TCU's team, and Fort Worth was plastered with billboards of Doctson and Boykin. When the receiver would visit his high school to talk to players—just as he had for years—they were, for the first time, star-struck. Doctson was still thin (he weighed 190 pounds as a senior) but had gone from slow to deceptively fast, with his long stride occasionally hiding his speed. As his team raced to an 8–0 start, his hands defined him. Take his 32-yard touchdown in the first quarter of a 52–45 victory at Kansas State on Oct. 10; Wildcats cornerback Danzel McDaniel tailed Doctson closely all the way to the end zone, and as Boykin's pass arced down, it was tough to tell who had snared it. Doctson, of course, stood up with the ball—and six TCU points. "If the pass is behind me, doesn't matter where it's at, I am going to catch it," he says. "I am a guy that is a consistent deep threat that will make the big catch and the big play when we need it." He made his name by jumping high, reaching farther, holding tighter. Despite being undersized, he developed an uncanny ability to box out defenders and shield them from the ball. "Hoops helped me with the timing of jumping and catching," Doctson says. "And then finding the rim definitely took a lot of hand-eye coordination." His season ended early after he broke his left wrist in a 49–29 loss at Oklahoma State on Nov. 7, but Doctson completed his senior campaign with 1,327 yards and 14 touchdowns and set TCU career records for catches (179), receiving yards (2,784) and receiving touchdowns (29). 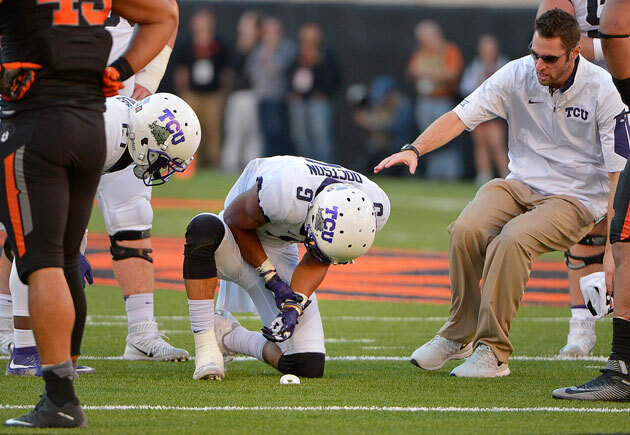 Although the team initially thought Doctson would have a chance to come back for the Alamo Bowl against Oregon on Jan. 2 (the Horned Frogs won 47–41 in triple overtime to finish 11–2), the injury proved worse than doctors believed. The wrist, it turned out, would need two pins, and he was in a long-arm cast for six weeks, until just before he arrived at EXOS, a San Diego performance training facility where he spent his winter preparing for the NFL combine. Doctson's first day at EXOS was Jan. 4, and he arrived feeling slow and out of shape. He hadn't done much cardio since the injury, and his upper body had lost strength. Brent Calloway, a performance manager at the facility who worked with Doctson all winter, says he was struck by how small the receiver first appeared. Yet Doctson's early speed numbers were encouraging, and soon he had put on whatever girth he had lost. As the weeks ticked down to Indianapolis, Doctson, who had been training four times per day, six times per week since early January, felt confident about the combine. The staff at EXOS had also drilled him on the off-the-field portion of the event, taking him through bizarre questions coaches and general managers might ask, showing him what the cards that lay out interview teams and times would look like. There, too, Doctson felt prepared—until he got his cards. EXOS had indicated he might talk with eight teams. When he arrived at the combine, 18 requested time with him. "I thought somebody put an extra card in my bag," he recalls, laughing. He was immediately popular—and that was before the wide receiver drills, where he performed in the 93rd percentile of all receivers' SPARQ (Speed, Power, Agility, Reaction and Quickness) scores. Over the past 17 draft classes, only 13 wideouts have matched his speed (4.5-second 40-yard dash), vertical jump (41", best among receivers), broad jump (10' 11", second best) and height—and he scored extra points by weighing in at 200 pounds. According to one AFC East scout, Doctson solidified a spot in the first round of the draft, and even if his size will likely keep him as the second receiver off the board behind Ole Miss's Laquon Treadwell, he may have the greatest upside of any player at his position in the 2016 class. Asked if any moment at the combine took him aback, Doctson is measured. He was prepared, in a sense, for all of it, but the ridiculous stands out. In his interview with the Bengals, he says, a coach asked him at the outset to remember four words: sock, green, brother, golf. Easy. He'd be asked at the end to repeat them, so he filed them away. Then, he says, he was asked a more complicated question: If you're standing at the northeast corner of a grass field at 4 p.m., which way is your shadow cast? In the moment, his head swam. He asked if someone could repeat the question. He knew the sun rises in the east and sets in the west—but he didn't have time to think it through. He couldn't say nothing, and guessing was the next-best idea, so he did. "East," he told the assembled personnel. He was correct. It's staggering, really: After all these years, after all the doubts, what stand between Doctson and the NFL are four words and a shadow. He knows the answers and has the confidence to trust his gut when he must. As for too skinny, too fragile, not good enough to notice—the voice that whispers those barbs is quiet now. It has been six years since the splint, since that argument on the patio, but it might as well be six lifetimes. What could have been has become what is, and it's beyond anyone's wildest dreams.